Unless you’re a financial titan (or got your house on the cheap) your home is probably the biggest investment you’ll ever make, so don’t screw it up by not having the proper insurance. If you’re like most homeowners, you probably have the same policy you did when you first bought your home. Maybe you updated the policy when you did work on your home… or maybe not. If you’re a renter, you sure as heck should consider getting a policy because your landlord’s insurance won’t cover your stuff. And a special note to condo owners: Your association will have a master policy that covers much of what can go wrong, usually from the walls out. From the walls in will be your responsibility, so work with an agent who can read (and hopefully understand) your condo association’s policy to learn where its coverage ends where yours needs to begin. 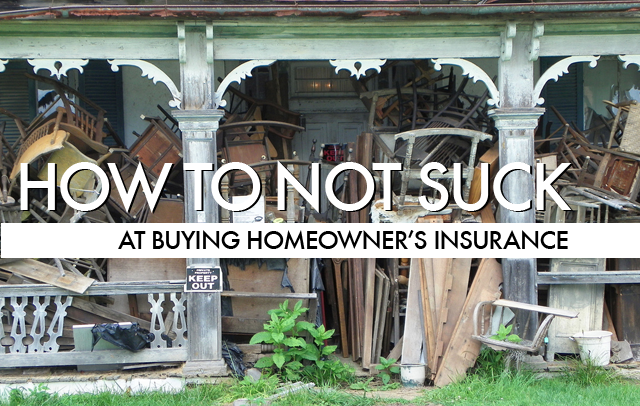 Without any further ado, here are 15 things you need to know about homeowner’s insurance. 1. You’ll have to decide what kind of coverage you want, and the costs vary. Market value coverage would pay you the current cost of your home. These policies are generally less expensive because they’ll only pay you the value of your home based on market conditions. But what you really want — and it’s worth paying more for — is guaranteed replacement coverage. This will cover the actual cost of rebuilding. Ask about extended replacement coverage, too. Some policies offer a “cash out” option, which is really only good if you choose not to rebuild, so if your home is your castle, that won’t be enough for you. This will vary from policy to policy, but generally, your homeowner’s policy will cover fire, theft, and vandalism for your property and lots (but not all) of the stuff inside (See No. 5 below for more on that). It may also cover damage from certain kinds of storms. Many Superstorm Sandy-damaged homeowners are still battling their insurance companies over coverage from water damage and wind damage, so make sure you understand the details of your policy before another storm of any kind hits. Ask lots of questions, and move on to No. 3. 3. Even a policy with bells and whistles probably won’t cover flooding. So you need to purchase a separate flood insurance policy if you’re in a flood-prone area. Check out the National Flood Insurance Program and FEMA’s list of insurers who offer flood insurance policies. Tornadoes are often covered by standard policies, but don’t expect coverage for earthquakes, landslides, war or government actions, either. Ask about what’s excluded under the good old “Acts of God” clause, and figure that damage from a nuke (as if you’d want to stay in your neighborhood if it’s hit) is excluded. 4. Don’t let the bank pick your policy for you. If you have a mortgage but you don’t have homeowner’s insurance, your mortgage company will probably pick a policy for you and include it in your escrow payments. The lender is protecting its investment, but you can be pretty sure the policy will be more expensive, and cover less, than one you pick out on your own. 5. Some items may need additional coverage. Some high-value items in your home — perhaps an engagement ring or collectibles or artwork — may require a separate “rider” on your policy. Again, ask your agent. 6. Most policies cover your belongings when you’re not home, too. For example, your auto insurance (see last week’s story) probably won’t cover a laptop stolen from your car, but your homeowner’s policy probably does. Even your cell phone may be covered (so you can save on those troublesome phone company insurance policies). And if you go on vacation or send a kid to college with stuff, that stuff may also be covered. Ask. 7. Water damage is a tricky one. So it’s smart to ask your insurance go-to person for a clear explanation of what happens when stuff gets wet. Damage caused by a leaky pipe or a flooded dishwasher may be covered, while the aforementioned flooding probably won’t. Ask about whether or not mold damage is covered — and under what circumstances — because remediation can be pricey. Also inquire about damage from — ick — sewer systems, and make sure you don’t confuse sewer with septic tanks, which are treated differently by most policies. 8. Accidents happen, and some are actually covered. Maybe your dog’s powerful tail takes out your big screen television, or your kid does jumping jacks on your glass table, or your drunk uncle spills a goblet of red wine on your white carpet. Your policy may help with repair, replacement or cleaning bills. 9. That frozen half-cow in your basement freezer might be covered. If you lose power for an extended period and you have to toss all the food from your fridge and freezer, your policy may help you restock. 10. Re-keying may be included. If you lose your keys, some policies will cover the cost of new locks for your home. 11. Don’t be left in the cold (or wet). If your boiler dies or a pipe bursts, some policies will pay for emergency repairs. 12. Safety is often rewarded. Most insurance companies will offer a discount if you have deadbolt locks, central station alarm service for security and fire, sprinkler systems and more, so ask your agent how you can save. You’ll also have cheaper premiums if you insure your home and your car with the same carrier. 13. Temporary lodging may be available. If your home is unlivable, you’re going to have to move into a hotel, or worse, you’ll have to beg your family and friends to take you in. Instead, see what your policy covers for an alternate place for you to stay. 14. Coverage for legal assistance could be included. If you need legal help because someone sues you for injury, or if there’s a land dispute with your neighbor, your policy may cover this. Given our litigious world, you may want to add extra coverage with an umbrella liability policy, which usually only costs a few hundred bucks a year. 15. The lowest price doesn’t mean the best policy. Sure, you will find wide differences in premiums per policy — even for ones that seem to offer the same coverage. That’s why you have to shop around and ask lots of questions… no way around that. Talk to friends and family members about who they use, and it’s a bonus if you can ask someone who has had to file a large claim. You’ll learn a lot about the attention given to customers and how claims are treated. The last thing you want when you’re dealing with a loss is sucky customer service. Remember, even if you’re covered for all kinds of items, if you file a claim for everything, you may soon find yourself without an offer to renew your policy once the year is out. So file claims sparingly, and talk to your agent if you have concerns about making a claim. There’s one more must-do: If the worst happens, it pays to have proof that you own what you say you own if you ever have to make a claim. Take a video or lots of photos of every room in your home, and at every angle. Open your jewelry box and closets, show off your record collection and keep a good record of any new items you purchase. Save receipts. And don’t forget to document stuff on the outside, such as sheds, decks, lawn furniture and so on. You should redo this photo/video sweep of your home once a year. Make sure to keep this proof of your stuff in a place other than your home. It won’t do you any good if it burns down or gets soggy with everything else. Use the Insurance Information Institute’s home inventory checklist for some help. And don’t forget, as time goes on, make sure to keep updating the photo and video records of your home and its contents, because as your life changes, so will your stuff.